If you have ever tried depositing large checks at your bank, you may have run into an issue where the bank places a hold on the funds. It can be frustrating to not have access to your money right away. However, it is important to realize how holds work. Insurance Settlement Checks: Insurance settlement checks are returned or disputed more often than other types of checks. This may be an automatic flag for a hold even if the amount is quite small. If you are depositing this type of check, you should be prepared to have a hold placed on the check and to give it a few days to process through the bank. 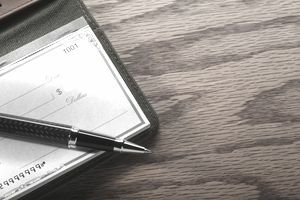 Large Checks: Checks that are for large amounts can have a hold placed on them. If your check is for $5,000 or $10,000 or more you may expect a hold to be placed on the check until it clears. This is particularly true if you do not usually have that much money in the bank or if the check is a personal check as opposed to a business check. Out of State Checks: Large checks from out of state banks may also trigger a hold. These holds may be longer than the other types of holds because the bank will have to wait a bit longer to collect the funds from the bank. These holds may be placed for up to ten business days. Once a hold has been placed, you will need to wait for the money to be released to you. The bank usually puts a blanket hold in place that will last for five or ten business days. You can call the bank after a few days to see if the money has been collected and if the bank will release the hold early. If it is an out-of-state check, you should expect at least five business days and wait to call until then. You will need to speak to a representative and not just go off of the balance shown on an ATM statement. Every bank has its own policies, and banks can also place temporary holds on cashier's checks and cash deposits. When you hear about the hold, you might feel frustrated, especially if you need the funds right away. Unfortunately, the teller or customer service representative who is helping you cannot change the bank's policy. If you want an exception to the policy, you will most likely need to speak to the manager. Generally, they will not make an exception unless you have been with the bank for an extended period of time and you have quite a bit of money in the bank. However, they may be able to make a portion of the deposit immediately available to you. It is important to consider ways that you can avoid the account-hold situation completely. One of the things that you can do is to have the money transferred via ACH, directly to your account. Many businesses can do this, and it really depends on who is paying you the money and the reason for it. Before you accept a large check, you may want to see if they can do an ACH transfer instead. Another option is to ask for a cashier’s check, which consists of guaranteed funds, although the bank may still place a brief hold. Although it can be frustrating to not have immediate access to the money, it is important to realize that the hold is protecting you as well. If the check does come back and you have already spent all of the money, then you will have to pay it back. This can overdraw your account and cause other payments to bounce. If the check is for a large amount it can be difficult to come up with the money quickly, or you could even end up damaging your credit as a result of the returned check. When you are dealing with large amounts of money, it is better to plan extra time to allow everything to clear. This may mean delaying purchases for a few weeks.